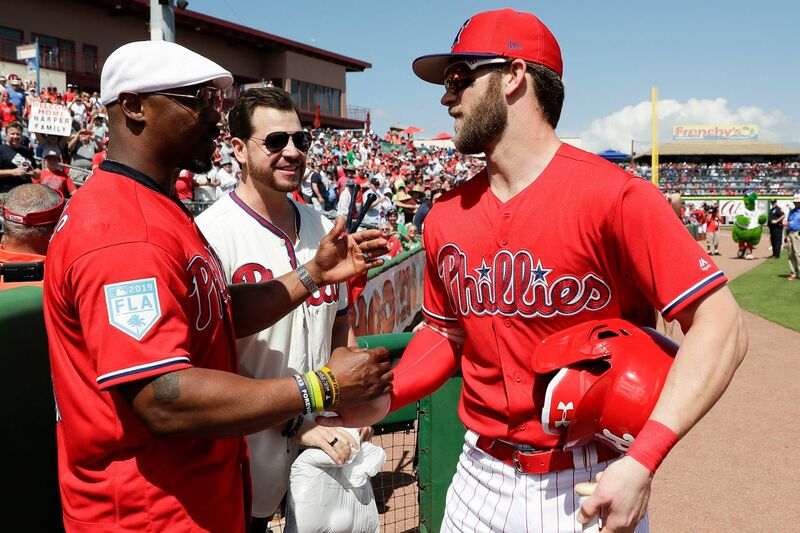 Bryce Harper meets Eagles great Brian Dawkins before Harper's spring-training debut with the Phillies. CLEARWATER, Fla. -- The Phillies had the money to sign Bryce Harper when they landed in January in Las Vegas and knew it would be difficult for another team to outbid them for the services of the free-agent superstar. But what else besides money could separate them from the other suitors who flew into Vegas? Enter Weapon X. The Phillies, in what manager Gabe Kapler called a “collaborative effort,” gathered video clips from notable Philadelphians: athletes, politicians, chefs. They packaged the clips and premiered the short film for Harper and his wife, Kayla, when they met them in a Vegas hotel. And before Harper made his spring-training debut on Saturday, Dawkins buttoned up a Phillies jersey and grabbed a microphone to rally the crowd before the first game of the player he helped the Phillies land. Brian Dawkins spoke to Phillies players before Saturday's game. Dawkins visited the Phillies clubhouse in the morning to speak to the team. Rhys Hoskins said he was “ready to run through a brick wall.” Jake Arrieta said Dawkins’ speech would “resonate with us for a long time.” Harper said it was great to hear from “a Philly legend.” It was also great to meet one of the stars of that video. Dawkins spent all but three years of his 16-year career in Philadelphia. He experienced the highs -- 2004’s NFC championship -- and the lows -- a three-win season in 1999 -- during his run with the Eagles. He understands the mindset of the Philadelphia fan better than most. And perhaps that is where he can be most beneficial to the city’s new $330 million superstar. Expect the fans to boo, Dawkins said, if you don’t run hard to first base. “You think they’re going to clap,” Dawkins said. Play hard, Dawkins said, and you’ll be fine. Jake Arrieta allowed two runs in 11/3 innings as he made his second start of the spring. “It wasn’t as crisp, but the the stuff is still good. I just need to refine some things,”he said. ... Aaron Nola will start Sunday in Sarasota against the Orioles.